Oscilloscope Pro is useful tool for electronic engineers/audio engineers wanting to monitor electronic/audio signals Find this application by searching for Oscilloscope in the market or use the QR code to the right. Currently there are two input options for the application. The newest and best input option is a USB hardware device provided by Gabotronics. USB host mode has now been compatible since android 3.1, therefore most new phones and tablets will support USB host mode (Please check device). NFX Oscilloscope supports the Gabotronics Xprotolab (firmware V1.84 and greater), this has 2 analogue input channels and 8 digital channels and measures a tiny 2.5 x 4 cm!! The device it’s self is a cheap portable alternative to most mainstream oscilloscopes, and has many different features. Connecting the Xprotolab to the NFX Oscilloscope provides a powerful and cheap oscilloscope platform for your portable needs. For more information on the Xprotolab click the following link. So match this application with the cheap device from gabotronics and you will get a great portable oscilloscope! Note: Only the analogue channels are supported on the xprotolab, future updates will bring digital and tone generator support. Currently the NFX OScilloscope only supports the 2 Analogue channels on the Xprotolab, but updates will bring AWG (onboard tone generator) and digital inputs support. Currently the USB mode has been tested on Samsung Galaxy Nexus , Asus Transformer , Asus Nexus 7. Usage of the application is simple with many features implemented with touch gestures and a quick preference side bar which is highlighted yellow in the picture. Auto : This continuously displays the input, but will also trigger on signals which exceed the trigger threshold. Trigger : This is designed to monitor continuous signals, for example a sinusoid. The following shows the controlling gestures. Dragging in the Y axis will move the nearest channel up and down. Dragging in the red area will move the trigger level up and down. The second option is the microphone input to the android device. This can be used to attach a scope lead to the jack socket. More information can be found at the following website. Impulse : The impulse mode has an extended time range in comparison to the trigger mode, there is an also flag which can be set to only trigger once and stop monitoring. In this mode it is possible to drag the time line along and view data after the trigger point. The simple UI allows fast manipulation of the X and Y axis, along with quick manipulation of trigger positions and amplitudes. From the menu it is possible to move to a settings page where the trigger detection(falling/rising/both edge), sample rate, voltage span amongst others. That’s the full run down of the application. See the images below for examples of the UI. You might add a related video or a pic or two to get readers interested about what you’ve got to say. In my opinion, it could bring your posts a little bit more interesting. Unfortunately this is my second job and I do not have the time to put into web design. Therefore all my time goes into the development and stabilisation of the application. Thanks again, I hope you understand. What android versions is this compatible with? Was not able to install it on android 4.0.3. Install from AndroidPit worked. Thanks for the support. Have to wait for my cable to ship. The app is running, and sampling from the speaker works. Of the 2 choices in inputs… is there a certain one that is more accurate and is there one that works better for the Nexus 7 tablet? Does your app support X-Y mode for a component tracer? From a WIN 7 machine. also crashes on Android Tablets, both the T-101 and the V909. Suggestions? Hi, Sorry this is a debug dialogue had in there to try and work out when it happened. One question I have though, how and why are you running this on a win7 machine? When does this crash happen? Any more info, please could you email nfxdevelopment@gmail.com so I keep records. I have a Win 7 machine, works after complaining, works great when it is not crashed, once up it is stable. 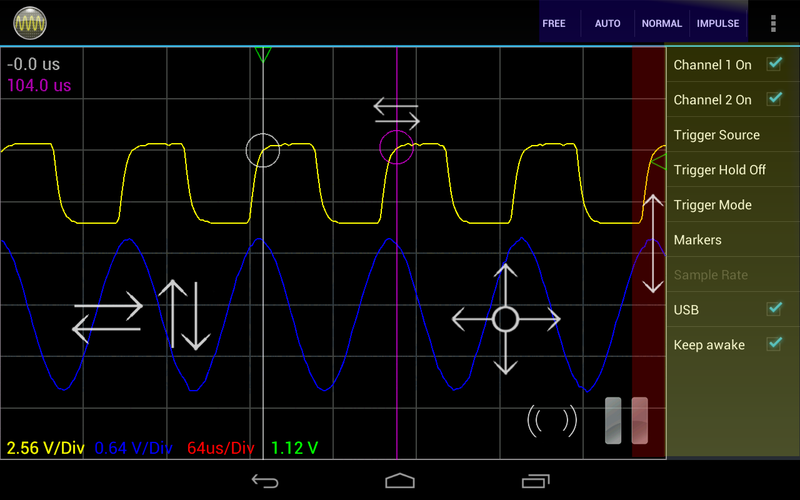 I have the NFX Oscilloscope app on a ASUS T-101 and a T-mobile LG-V909. The V909 is erratic, crashes, may not find the USB device. I have never gotten the T-101 to find the oscilloscope. Found this.. thought it might be helpful to someone. It seems to cover various ROMs and what’s being reported as claiming to have USB Host support and what actually does. I’m not totally sure the Asus Transformer TF101 has support, it’s a little confusing. Also, reading somewhere else it seems like you might need a USB OTG (On The Go) adapter cable that allows the device to act as host. So maybe it’s not just software support but might also need this OTG cable as well? I’m just starting into learning electronics and from what I saw years ago, an oscilloscope would be very helpful so I’m researching before I buy. Using my existing Android devices as a display would be a great space saver, and I’m sure save a few bucks as well… plus the ability to upgrade software is pretty nice. Would USB microphone work instead of the internal one when using a tablet with OTG support, such as the Nexus 7 ? The oscilloscope should work with any microphone plugged into the device, as the application will pick up the primary microphone from the Android device. While moving cursors to the right-hand part of the screen in an attempt to turn them off. I just bought the app from Play Store right now, so I suspect I have recent code. Thank you. I have just sent out a update, which is V6.1.21 , this should fix your problem. I hope you enjoy the application. When I was changing sample rate from 44.1 to 28 kHz. Thank you. Hello, is there any update for fixing this bug? Thank you. I have just posted v6.1.22, which will have a fix for this bug in. Once again I thank you or bringing this to our attention. Not sure what’s going on, but the green trigger level marker has disappeared. It shows up in microphone mode but not in USB mode with the Xprotolab Plain. I can still drag in that area and see the trigger value change, but the green marker is gone. Any thoughts?